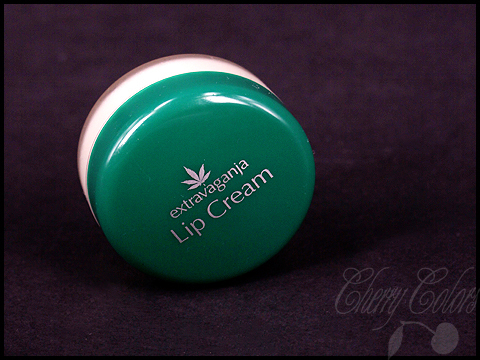 Review: Extravaganja Lip Cream - Cherry Colors - Cosmetics Heaven! Today's review is about my latest must have item in my purse. I usually use my lip balms every single day. I was used to use 1 lip balm in two weeks, but now luckily that has stopped because I don't need to moisturize my lips that much. Lip Cream is a mixture of hemp seed oil and beeswax, which restores cracked and dried skin. It protect your most tender parts from sun, wind and lost of moisture, while ethereal vanilla presents an unforgettable taste of freedom. It comes packed in a lovely little white box (not pictured) which has written Extravaganja Lip Cream on it, and on the other side it has the ingredients listed. Pretty neat thing! Cera Alba, Butyrospermum Parkii, Cannabis Sativa, Theobroma Cacao, Olea Europea, Glycerin, Vitis Vinifera, Rosmarinus Officinalis, Hamamelis Virginiana (and) Cucumis Sativus (and) Tebebuia (and) Mel (and) Alcohol Denat (and) Inositol (and) Allantoin (and) Niacinamide (and) Piridoxyne HCL, Lamolin, Vanilla Planifolia, Parfum, D-Limonen, Linalool, Benzylbenzonat. Package itself is a pretty round jar with 15ml of product in it. I like AND dislike the fact that it is in a jar, because it's really unhygienic if you're not at home or don't have with you the hand disinfecting gel. It's a sturdy jar, mine survived traveling and a couple of falls on the floor without a problem. The design is a bit of old style, but I really don't mind. The texture is a white at first creamy lip balm which changes its consistency depending on how hot it is in the room you are in. If it's hot it melts a tiny bit (becomes more of an oil in some spots, but it never melts completely), in cold it becomes hard. The first 1/2 of the balm is really gentle and creamy, but after you are under that magic 1/2 of the jar you can feel tiny little parts that melt in your fingers while you're spreading the cream on your lips. They are not really bothering me, but I'd prefer if the consistency would be creamy all the way to the end. This actually reminds me of Balm Balm lip balms. Something similar was happening with those too. The scent is not overpowering, but it's definitely there. Warm vanilla with a bit of artificial (or something) in it. Not the most pleasant scent, but it disappears on your lips. I bought it because I remembered my older sister loved it and well, I needed a new lip balm. And of course, I can't resist small cute boxes, even less if I know there's a tiny jar in it! It was love at first touch (lol). It melted on my lips, didn't let the wind dry them out and made them feel super moisturized and soft! I absolutely loved the texture, and how easy it was to transport with me. But at the same time I hated the fact it is in a jar. But what to say.. that one is a love/hate relationship when it comes to lip balms. I couldn't remember how much I paid for this little fellow, but today while my dear was shopping I asked him to buy me another one. And then I checked the price on the receipt (what to say I was in a hurry) It was only 1,45€!! Overall: I think this one will be a staple in my make up bag and in my purse. I will keep using it every day when my lips need some moisture and protection from the weather. If you have the chance to try it, then do it. I know that I love it <3!